What does a fifty-foot stainless steel steeple look like before it is attached atop a temple for an LDS church? It looks perfect—just ask the four architects and two contractors that showed up at our shop to inspect the steeple three times before it left in transit to Sacramento, California. The steeple sits some sixty feet, at the base, above ground level. Small defects would never be detected by patrons looking up at the majestic building but, as the inspectors explained, that was not the issue. 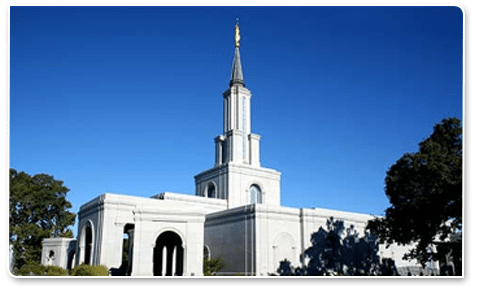 To the LDS church and its members, these temples represent their highest form of worship. The building and the quality of its construction—even to the smallest detail—are vitally important because it reflects and symbolizes their commitment to God. We were astonished at the inspection rigor but were thrilled to put our skills to the test and pass with the highest marks. The steeple was eight-sided, meaning seven seams with all the curves, bumps, bends and offsets had to be laid out, laser cut, and formed perfectly to fit in such a way that the welding could be ultra tight and clean. After the steeple was welded and ground completely smooth, the entire surface was chemically etched to give it a stained / marble appearance that looked phenomenal. AMF stained numerous sample pieces to get the exact right color and texture envisioned by the church’s design team. Ultimately, the many processes of design, engineering, project management and fabrication all came together—almost simultaneously—to generate a perfect final product that thrilled our customer and continues to thrill the countless visitors who travel to the site every single day. AMF specializes in metal project fabrication. We deliver quality architectural metal fabrication projects by utilizing great teams of talent—people working as experts in estimating, project management, engineering, detailing, and production—and use their specialized skills to add value to the project from inception to completion. We deliver what our customer’s expect—Give us a call to find out just how good that can feel.